A good reputation is very important for online casinos. Only casinos with a good reputation and good player reports make it into this White List. 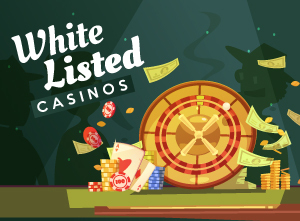 White Listed online Casinos have good customer service, are able to deliver your winnings within a reasonable time frame, have good software, and are overall a safe place to play your favorite games. The casinos on this list are by far not the only ones that are trustworthy, any casino represented on this site is well screened. The bad ones are only found on our Casino Blacklist. But the online casinos below are handpicked and encompass all the different types of software, so you can get a bit adventurous if you like. Minimum deposit amount is 10 EUR / USD and maximum is 300 EUR / 320 USD (or currency equivalent). New Customer Offer. T&C’s Apply. 18+. 100% up to $300 + 100 Free spins (Slots: London Hunter | Habanero). Minimum deposit 25 EUR 40 CAD 250 SEK 100 AED 150 TRY 400 ZAR. The max bet is 4 EUR-6 CAD-40 SEK-16 AED-24 TRY-65 ZAR. It has a requirement of 40X (D+B) for match 100% and 30X for match 50%. The 400% welcome bonus is only redeemable upon a player/household/computer’s initial approved deposit. The 400% bonus is available up to the value of €1000. Minimum deposit: $25. Bonus amount must be wagered a minimum of 30 times for slot games. New Customer Offer. T&C’s Apply. 18+. In standard terms and conditions there is no wagering requirement,for any additional information please contact customer service. Due to an overwhelming history of promotional abuse, players from Denmark, China, and Poland are not eligible for bonuses. Players from Bulgaria, Costa Rica, Finland, Italy, Latvia, Netherlands, Sweden and the Ukraine will be forced to abide by separate wagering requirements for offered promotions. New players only. T&Cs Apply. 18+. + 150 SPINS on your game of choice. Minimum deposit: 10€. Players are only allowed to make a one-time withdrawal for a maximum amount of 10x the original deposit when the winnings result from playing a deposit/reload bonus. Any additional winning credits will then be forfeited. Slot games Scrooge, Devil&apos;s Delight and Bloodsuckers are excluded from all bonus promotions. If a player plays these games whilst wagering a bonus, the bets placed on these slot games will be deducted from the player’s real money balance (if available) and they will not contribute towards wagering fulfilment of the pending bonus. New Customer Offer. T&C’s Apply. 18+. The maximum bonus amount is €100. You must win at least 3 times the amount of the bonus before a withdrawal is allowed.120x (deposit+bonus) playthrough. A maximum cashout of 10 times the bonus plus your deposit applies. GET YOUR 300% UP TO $2,000 EACH OR 540 FREE SPINS ON YOUR FIRST 3 DEPOSITS! Bonuses are not available to players residing in the following countries: Israel, India, Lebanon, Romania, Poland, Russian Federation. Please be advised - the use of bonus credits to place wagers on Baccarat, Craps, and European Roulette is not allowed. On each of your first 3 deposits you can claim one of these bonuses: Receive a 300% bonus up to a $2,000 bonus; Deposit $50 or more for 60 Free Spins - $180 value, the max that you could win is $160; Deposit $75 or more for 90 Free Spins - $270 value, the max that you could win is $240; Deposit $100 or more for 120 Free Spins - $360 value, the max that you could win is $325; Deposit $150 or more for 180 Free Spins - $540 value, the max that you could win is $475. Code valid on slots unlimited times. No Max Cashout. Minimum deposit: $25. 250% up to $2,000, or 165 Free Spins on each of your first 4 deposits. Minimum deposit: $25. Bonuses are not available to players residing in the following countries: Israel, India, Lebanon, Romania, Poland, Russian Federation. Please be advised - the use of bonus credits to place wagers on Baccarat, Craps, and European Roulette is not allowed. Minimum deposit: $35. Skrill and Neteller initial deposits do not qualify for the 100% bonus. Due to continuous severe abuse of promotions, management reserves the right to refuse/remove bonuses and associated winnings for all players residing in Colombia, Denmark, Taiwan, Albania, People&apos;s Republic of China, Greece, Finland, Poland, Russia, Moldavia, Ukraine, Azerbaijan, Moldova, Latvia, Slovenia, Belarus, Georgia, Czech Republic, Norway, Colombia, and Sweden. This only applies to players that are deemed by management as non-recreational. New Customer Offer. T&C’s Apply. 18+. No max cashout. Minimum dpeosit: $25. 295% Slots Match Bonus (Bonus Code: SHAMROCK)can be claimed only after playing with IRISHCHARM. New Customer Offer. T&C’s Apply. 18+. Bonus funds are valid for all slots (and scratch cards) by Play&apos;n GO, Playson, Booming, Booongo, Felix, Betsoft, Wazdan, Evoplay, MrSlotty, Fugaso, GS. Minimum deposit:€20 (200kr, $20). Accounts from the following countries, will be exempt from bonus redemption upon creation of an account: Greece, Poland, Russia, Romania, Sweden, United Kingdom, Ukraine, Bulgaria. You must win at least 3 times the amount of the bonus before a withdrawal is allowed. The maximum you may withdraw is $ 56. Minimum deposit: €25. A maximum cashout of 5 times the bonus applies. If your balance is less than the amount of the bonus you will not be able to withdraw. Minimum deposit: €25. In order to receive any promotion you must go to the promotions section in the casher, hit *Claim* and then make the deposit. In standard terms and conditions there is no wagering requirement,for any additional information please contact customer service. New Customer Offer. T&C’s Apply. 18+. Minimum deposit: $25. Minimum deposit:$20. You may use this coupon with your first or second deposit. Maximum cash out $2,000.Minimum deposit: $20. Only the following games count towards the wagering requirements of the bonus: some Real Video Slots, some Slots, Keno and Scratch Cards. Minimum deposit: $25. If your balance is less than the amount of the bonus you will not be able to withdraw. Players from China, Ukraine, Latvia, Italy, Sweden, Denmark, Bulgaria, Costa Rica, Poland, Finland and the Netherlands may not be allowed to claim bonuses due to high levels of promotional abuse coming from players in these countries. New Customer Offer. T&C’s Apply. 18+. Max Coupon Amount: $3,000. Bonus amount must be wagered a minimum of 30 times for slot games (Particularly, video slots, 3-reel slots, keno, bingo, and scratch cards) or a minimum of 35 times for card games (Video poker, Blackjack, Blackjack multi-hand, Tri-Card Poker, Three Card Rummy, and Texas Hold’em Bonus Poker). PLUS 50 Spins. Only bets placed on Slots, Real-Series Video Slots (excluding progressive slots), Keno and Scratch Cards count towards the wagering requirements of the bonus. Player must deposit a minimum of $25 or higher to qualify for this promotions. Players from BULGARIA, UNITED KINGDOM, GREECE, POLAND, ROMANIA, RUSSIA and SWEDEN can not claim any bonus offers at the casino. Minimum deposit: $20. No Max Cashout. Players who have a USD account on Uptown Aces are unable to create an AUD account on Uptown Pokies. Players from BULGARIA, UNITED KINGDOM, GREECE, POLAND, ROMANIA, RUSSIA and SWEDEN can not claim any bonus offers at the casino. Minimum deposit: $20. No max cashout! New Customer Offer. T&C’s Apply. 18+. 200% Bonus up to US$500 ($700 AUD/CAD). Min deposit is $25 USD/ $30 AUD / $30 CAD or currency equivalent to be eligible for this welcome offer.When playing with a bonus, there is a maximum bet of €5/$5 (USD/AUD/CAD) per spin/round until the wagering requirement has been met. New Customers. T&C's Apply. 18+. BegambleAware. Min. deposit €20 (no Skrill/Neteller); Bonus = 100% of 1st deposit (up to €100)&apos; 25% of 2nd deposit (up to €600) and 50% of 3rd deposit (up to €300). 35xdeposit+bonus rollover in 15 days for bonus winnings release; 2nd and 3rd bonuses can be rolled over on mobile only; Bonus for wagering, deducted upon winning release; Withdrawal before rollover results in bonus cancellation; Rollover stake contribution varies across games. New players only. T&Cs Apply. 18+. BeGambleaware. The maximum bet amount permitted while having an active bonus is 12€. 18+. New players only. T&C's Apply. One bonus offer per player. Minimum deposit of £20, Max bonus bet £5 Bonus offer must be used within 30 days and bonus spins within 10 days, otherwise any unused shall be removed. Bonus spins are valid on the following games only: Asgardians Stone and Bloodsuckers 2, Gonzo’s Quest, Twin Spin Delux and winnings capped at £50 Bonus funds are 100% of your first deposit up to £250, 50% of your second deposit up to £500, 50% of your third deposit up to £250 Bonus funds are separate to Cash funds, and are subject to 35 x wagering the total of bonus, cash & bonus spins. BeGambleAware. New Customer Offer. T&C’s Apply. 18+. 100% up to £200 FreePlay. £20 minimum deposit. FreePlay winnings are credited as bonus and capped at the amount of FreePlay received, unless a Jackpot win. New Customer Offer. T&C's Apply. 18+. NEW PLAYERS ONLY, MIN DEPOSIT £10, £8 MAX WIN PER 10 SPINS, MAX BONUS CONVERSION £250, 65X WAGERING REQUIREMENTS AND FULL T&CS APPLY. Up to 500 Casino Spins. Spin the Mega Reel to win up to 500 Casino Spins on Starburst or Fluffy Favourites. The Welcome offer: You will receive a Casino spin of the ‘Mega Reel’ when you make your first deposit. Prizes vary, ranging from Casino Spins to Amazon Vouchers. The ‘Mega Reel’ is where you will win all your promotional prizes obtained through deposits on the site. You will either be invited to play for FREE or pay a small amount to spin the Reel. After making your first deposit, you can claim a free spin of the ‘Mega Reel’ on each deposit of £20 or more. Amazon vouchers won from the Mega Reel will be emailed to the address registered on your account within 7 days. The maximum amount (for accounts that have made a deposit) which can be converted to your REAL (withdrawable) balance as a result of fulfilling the bonus wagering requirement is £250. Minimum deposit: $20. AU Slots Casino Welcome Bonus can only be used in CASINO section. Maximum bet when playing with a Bonus on top of your deposit is limited at 7,50 $/€. New Customer Offer. T&C’s Apply. 18+. To convert all your bonus into cash, you only need to wager/place bets for a total of 30 times your bonus. If you are wagering your first signup bonus, a 60 times wagering requirement applies. New Customer Offer. T&C's Apply. 18+.£10 Min stakes within 7 days. Min 5 game rounds. Max 50 Free Spins on selected games. 7 day expiry. Customers must stake a minimum of £10 on Casino games across 5 or more game rounds during their first 7 days play (at Betfred Casino) to qualify. New Customer Offer. T&C’s Apply. 18+. 100% up to €500 (minimum deposit €20) or 100% up to €500 + 500 Free Spins (minimum deposit €55) - You will unlock 50 Free Spins each day, for 10 days. Players from following countries are excluded from all and any free bonus offers, sign-up bonus, no-deposit free spins offered with games and bonuses, free bonus-money and all and any affiliate(s) related bonus and free spins offers: Bulgaria, all countries outside the European Union, Czech Republic, Croatia, Estonia, Hungary, Italy, Latvia, Lithuania, Poland, Romania, Slovakia, Spain. The bonus codes, WELCOMEGAMES can be redeemed once per player. New Customer Offer. T&C’s Apply. 18+. PLUS 20 Casino Spins. Minimum deposit is €25 Players from the following countries are not eligible to receive welcome bonuses and/or other bonuses unless otherwise is specified: Poland, Greece, France, Belgium, Denmark, Hungary, Bulgaria, Romania, Croatia, Ukraine, India, Pakistan, Spain, Italy, Indonesia, Russia, Czech Republic, Slovakia and Latvia. New Customer Offer. T&C’s Apply. 18+. Make a minimum deposit of £10. The Welcome Bonus you receive will be a fixed amount of £20. New Customer Offer. T&C's Apply. 18+. The minimum deposit amount is £5 for all subsequent deposits after the first deposit at the casino. The 100 changes are credited as a £25 bonus and players can wager 100 times at £0.25 on the Mega Moolah slot machines. A sixty times wagering requirement applies on the welcome bonuses and certain games contribute a different percentage to the wagering requirement. Game contribution: All Video Pokers except All Aces Video Poker, Caribbean Draw Poker, Texas Hold&apos;em Bonus Poker Gold, Triple Action Hold&apos;em Bonus Poker Gold, Classic Blackjack and all Roulettes count 2% towards wagering requirements. The first deposit bonus is subject to 60 times play-through before your balance may be cashed in. New Customer Offer. T&C’s Apply. 18+. Minimum deposit: €10. The maximum bet per round allowed on Slots will be 5% of the claimed welcome bonus. New Customer Offer. T&C’s Apply. 18+. The 100% Match Bonus for new Players on their 1st deposit is subject to a minimum £20 deposit, and the 1st deposit will be matched up to £250. This offer is available for new players only and only one claim per player is allowed. 40x wagering applies. The Match Bonus must be claimed within 7 days of the deposit being made. Game Playthrough Requirements Apply. New Customer Offer. T&C’s Apply. 18+. Minimum deposit: 20 | Maximum bonus: 500 | Wagering: 20x (deposit + bonus) | Free Spin wagering: 20x win amount | 30 days to meet wagering. PLUS 20 Free Spins. Minimum deposit: $20. Deposit and lose at least $200 at Casino Max and get up to $75 cashback! To collect, simply reply to this post and include the following: Your casino username. Losses Cash Back: $200 lost = $50, $250 lost = $60, $300+ lost = $75. All cash back amounts will be credited as soon as possible. No need to wait until the end of the month. Cashback requests will be sent once per day (including weekends) to the Casino so please allow up to 48 hours to be credited. Promotion begins: now until further notice. Max cashout: 10x max cashout on all cashback bonuses. Wager cashback: 10x. New Customer Offer. T&C’s Apply. 18+. 2nd Deposit Bonus: 50% up to $200; 3rd Deposit Bonus: 25% up to $150. The first deposit bonus is subject to 60 times play-through before your balance may be cashed in. Subsequent bonus amounts credited to a player&apos;s bonus account (after the first deposit bonus) will be subject to 30 times play-through before they may be cashed in. New Customer Offer. T&C’s Apply. 18+. Minimum deposit: £/$/€20. No risk wagers on Roulette are excluded. UK members must wager their refund bonus 40 times. New Customer Offer. T&C's Apply. 18+. £10 minimum deposit. 40 x wagering applies. Bonus valid for 14 days. Minimum £5 wager required to activate 200 Free Spins. 20 Free Spins will be credited per day for 10 days after qualifying deposit/wager is met. Free Spins valid for 24 hours from credit. Players from the following countries are not permitted to receive the first deposit bonus, any deposit bonuses or free spins unless otherwise stated: Lithuania, Belarus, Latvia, Czech Republic, China, Bulgaria, Poland, Bosnia and Herzegovina, Croatia, Greece, Republic of Moldova, Malaysia, Georgia, Philippines, Kazakhstan, Vietnam, Thailand, Indonesia, Nigeria, Bangladesh, Mongolia and Ukraine. Minimum deposit: $10. The wagering requirement must be met in full within 14 days of the Bonus being credited to your Bonus Balance, otherwise the Bonus Balance will expire. The following Video slots will be excluded from playing with Bonus balance: All Jackpot games, All live games, Pearls of India, Tower quest, Castle Builder, Forsaken Kingdom, Tomb Raider, Tomb Raider 2, Untamed Bengal Tiger, Untamed Crowned Eagle, Untamed Giant Panda, Untamed Wolf Pack, Peek-a-Boo, Aliens, Blood suckers, Big Bang, Champion of the Track, Dead or Alive, Devil&apos;s Delight™, Jackpot 6000, Kings of Chicago, Mega Joker, Robin Hood, Super nudge 6000, The Wish Master. *The following Video Slots will contribute 20% towards bonus wagering: Simsalabim, Big Bad Wolf, Supernova, Hot Ink, Arabian Rose.